Dozens of burqa-clad women political activists are roaming in the streets of Sulaiman Khel, located on the outskirts of Peshawar. These women spend a few minutes in every home. Begum Nasim Wali Khan was the first female who contested elections in 1977 on a party’s ticket. After her glorious career in Pashtun belt, it is a rare to see women asking their colleagues to stand for their rights and support a woman candidate. The Afghan war erupted in the region and the inhabitants of the region transformed the secular Pashtuns into religious fundamentalists. It took almost four decades for Pashtun women to be in active politics. These political activists gather women in different homes to convince them to register for voting and also to participate in the upcoming general elections. Jamaat-e-Islami (JI) former MNA Razia Aziz is leading the contingent in the dusty streets in middle of mud houses. “In 2018 general elections, women votes would make a big difference. Therefore, all parties, including the JI, have started their homework and preparation to utilise the opportunity,” she adds. JI has announced a massive campaign of women registration in Khyber Pakhtunkhwa (KP) and Federally Administered Tribal Areas (FATA). The 2017 electoral law is a step for making the Election Commission of Pakistan (ECP) an autonomous body and its awards more powers to it. The new law’s emphasis is on more space for women in legislative body. The Election Commissioner can declare results void if the ratio of women votes remains under 10%. The law further instructs all the political parties would have to award 5% general seats to women. In Pakistani male-dominated society this development towards women empowerment is historical. Unexpectedly, the right-wing JI welcomed women empowerment in electoral procedure. To meet the purpose and bring the deprived half population in active politics and teach them procedure of vote casting, JI started a campaign of registering one million women in Pashtun belt. The JI leadership has reservations over the arrangements for women polling stations. Keeping in view the previous experiences, Mushtaq Ahmad Khan, the JI Khyber Pakhtunkhwa (KP) chief, sent a detailed letter to the chief election commissioner, to address problem facing women in the upcoming elections. The letter asks the ECP to arrange equal polling stations both for male and female in KP and Fata. Beside this women staff is always a huge problem on the elections day. That is also one of the reasons of the low women turnout in conservative areas. The administration must ensure women staff for the day, the letter says. There are 127,096 registered voters in the PK-95 constituency of Lower Dir. Out of them, 53,000 of the registered voters are women. For such a huge number of women voters [53,000] there were only six polling stations and 12 female staff, the letter states. In by-election at PK-95 after the resignation of JI Ameer Sirajul Haq in Lower Dir, the local politicians of all political parties unanimously decided to stop women from casting their votes. ECP took notice and issued instruction for re-elections in the constituency. However, the order was challenged in Islamabad High Court. Resultantly, the IHC dismissed the ECP decision due to absence of such law. Now after the new law is introduced, political parties will not be in a position to exploit the rights of half of country’s population. Former JI chief Munawar Hassan is known for his stance. However, he asks all the political parties to bring women in the process of decision-making. “Now after making the law, the state should address women’s grievances in remote areas before the general elections,” he said. It wouldn’t be possible for parties in limited resources to make it successful and bring all of the women in the process, but state institutions should take responsibilities in women’s mainstreaming, he said. “Although it should be done before passing the bill,” he said. According to the latest census, 49.05 population of the province comprises female. According to the ECP, there are a total of 12,311,001 voters in KP. Out of them, 26,1736 are women voters. As per the census data, 1.78 million women voters are not registered yet. Razia Aziz is attached with JI for the past 28 years. She was an MNA during the Musharaf era. She is now and is now leading the massive campaign of one million women registration. She believes in the empowerment of women. She has convinced the JI leadership for giving more space to women in policymaking. “It’s insane how half of the population can be ignored? Without women, the dream of an everlasting and fruitful democracy won’t be achieved,” she said. The JI women’s wing has organised 120 gatherings in various parts of the province. 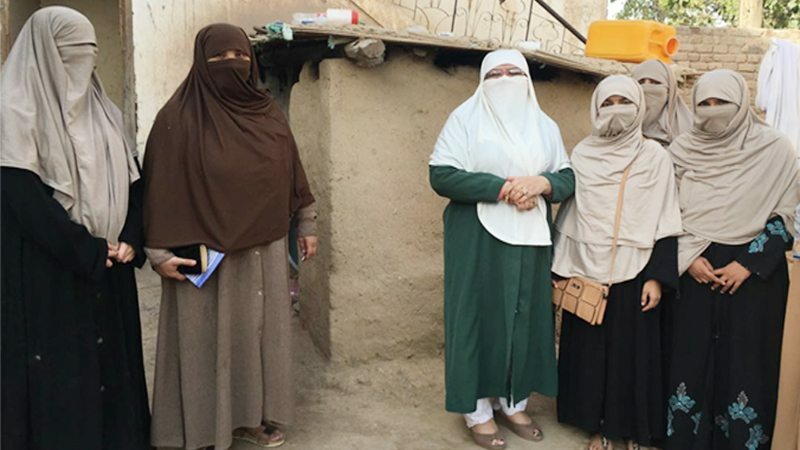 “Our goal is to educate and motivate women about vote casting and power of their votes in far flung as well as in urban areas of KP,” Razia says. JI Media Coordinator Muhammad Iqbal calls the step towards greater democracy, inclusive and prosperous Pakistan. “Without women’s participation, the country can’t progress,” Iqbal said. To a question, Iqbal said that actually the new law paved the way towards the founder of JI Maulana Maududi. There are speculations about the reshaping of Mutahida Majlis e Amal (MMA) before the upcoming general election. MMA was the amalgamation of religious political parties which had provided shelter to Musharraf while supporting the Legal Frame Ordinance (LFO). Culturally, a particular segment of this conservative society is trying to keep the half of the population in the dark. Razia Aziz is of the opinion that while giving democratic rights to the women and increasing women participation in national and provincial assemblies is the remarkable step from the government. “JI wasn’t against the women participation in any aspect of life, but always struggles for their rights in a separate spectrum. We will never support to make example the western society, Munawar Hassan points out.